Bí-kok Kok-bū Pō͘ (Eng-gí: United States Department of State), Hàn-bûn mā hoan chò Kok-bū-īⁿ (國務院), sī Bí-kok chú-koán kok-chè koan-hē ê liân-pang chân-kip hêng-chèng pō͘-mn̂g. 1789 nî 9 goe̍h 15, Bí-kok kok-hōe thong-kòe chi̍t hāng hoat-àn, lāi-bīn pau-koat kā chìn-chêng ê Gōa-bǔ-pō͘ (Department of Foreign Affairs) kái miâ chò Kok-bū-pō͘, che chú-iàu sī phòe-ha̍p hit-chūn phài chi̍t kóa kok-lāi sū-bū hō͘ in. Hia ê tāi-chì pau-koat ū hoat-pò͘ kap pó-koán Bí-kok hoat-lu̍t téng chē khoán kì-lio̍k khang-khòe. Hiān-chāi iáu koh î-chhî kok-lāi sū-bū ū Tōa-chiong (Great Seal) ê pó-chûn kap Pe̍h-kiong ê gî-sek téng tāi-chì. ↑ "Why is the Department called the Department of State?". Office of the Historian. 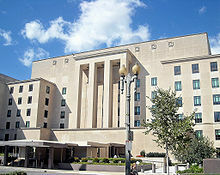 Office of the Historian, Bureau of Public Affairs, United States Department of State. 2017-01-25 khòaⁿ--ê.
Chit ia̍h siāng bóe tī 2018-nî 4-goe̍h 30-ji̍t (Pài-it), 04:13 ū pian-chi̍p--koè.